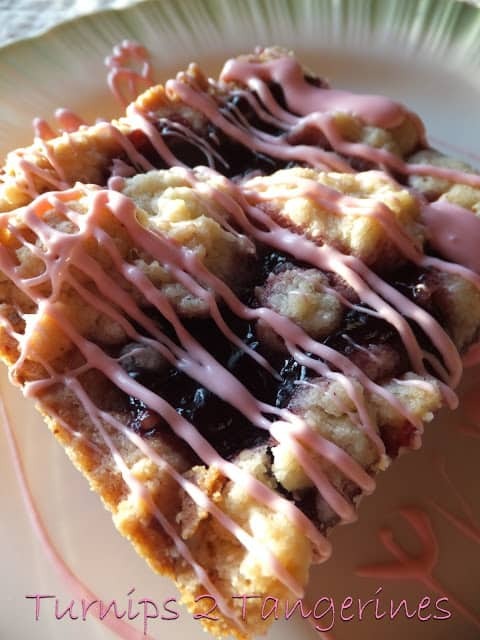 Raspberry Streusel Bars have a buttery pecan shortbread crust and a fruity filling made with raspberry preserves. They are a cinch to make and beyond delicious. Everyone who has tried these easy and simple bars, loves them. Made with very few ingredients, raspberry streusel bars can be whipped up in no time flat. They’re perfect to bring to a party, potluck or any function where a sweet treat is needed. 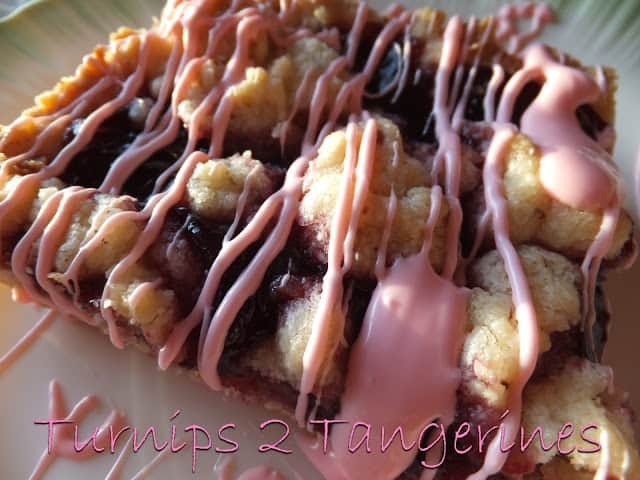 Want to change the flavor of these delicious bars? Simply change the preserves used. 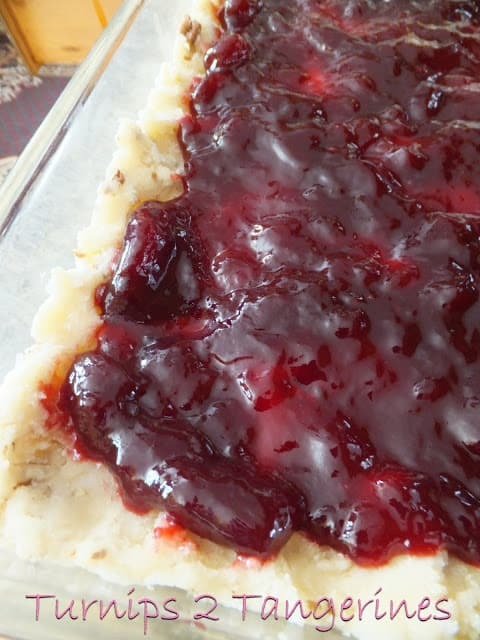 Strawberry, blueberry, black raspberry, even grape preserves can be used in this recipe. Try lemon or lime curd to give an already delicious bar an unique and different taste. A super simple glaze made of powdered sugar, milk, almond extract and a few drops of food coloring, is mixed together and drizzled over the top. Super simple yet so delicious. 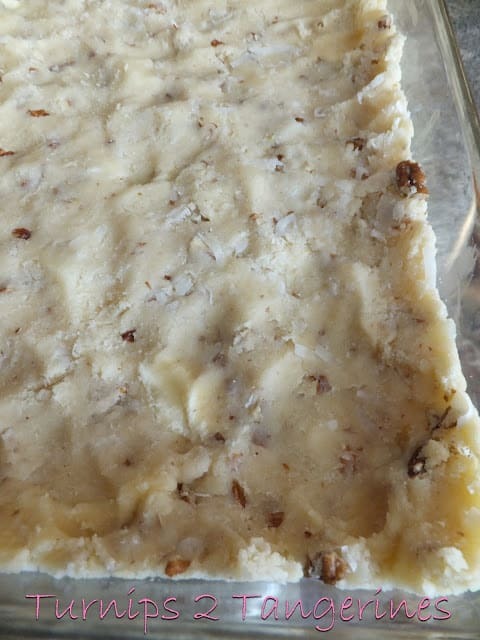 Delicious bars made with pecan shortbread crust. Preheat oven to 350. Lightly grease an 11 x 7 x 2 inch baking dish. In a large bowl, beat sugar and butter with an electric mixer on medium speed until combined. Beat in egg until combined, then beat in as much of the flour as you can with the mixer, stir in any remaining flour. Stir in pecans and coconut. Reserve 1 cup of the pecan mixture for the topping. Press the remaining pecan mixture into the bottom and up sides of prepared baking dish. Spread preserves to within 1/2 inch of the edges, sprinkle with the reserved pecan mixture. Bake for 45 minutes or until top is golden brown. Cool in pan on a wire rack. In a small bowl, combine sifted powdered sugar, milk, almond extract and food coloring if using. Stir in additional milk, 1 teaspoon at a time if necessary, to achieve desired drizzle consistency. Drizzle over bars and serve. Making Crackle Colored Eggs Plus Nests are a fun “experiment” that your kids and grand-kids will enjoy helping you take part in. Try a new way to decorate eggs this Easter season. 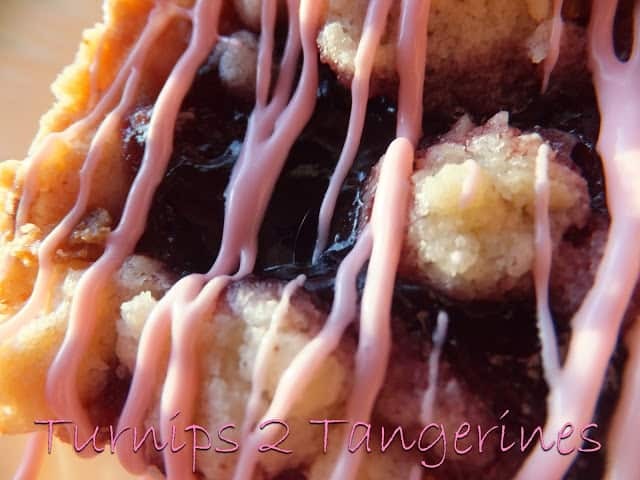 For the recipe we used a jar of raspberry preserves from Trader Joe’s. Raspberry Streusel Bars with Powdered Sugar icing are fantastic in any flavor. Change up the flavor by changing the jam used. There are many brands on the grocery store shelves, pick up a jar and make a pan of bars. Lynn-Thanks so much for sharing at What'd You Do this Weekend. These would be a great Easter treat. Looking forward to more of your stuff. Just saw this over at Flour Me With Love. I like the addition of coconut–these look delicious. I also love your blog header. I'll check back often. These look great and easy. I pinned for later. Thanks so much for sharing with us at In and Out of the Kitchen Link Up Party. Please add a link and share with your friends. 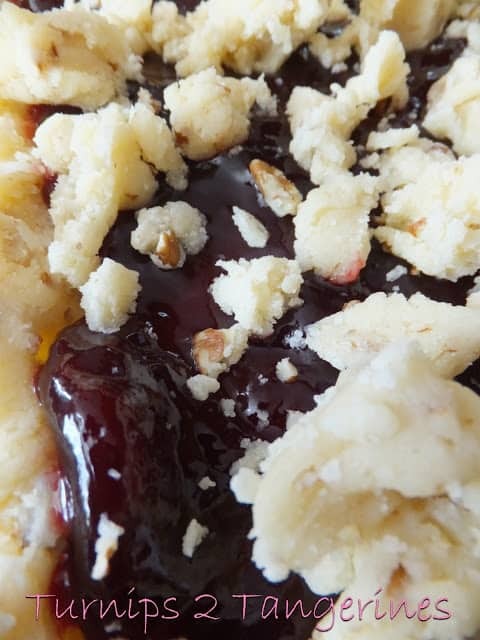 My family LOVES everything with streusel, but with raspberry jam – it's a hit!! The nuts and coconut in the crust take this streusel up sooo many notches! Yum! These look delicious and I love the raspberries. Thanks for sharing. 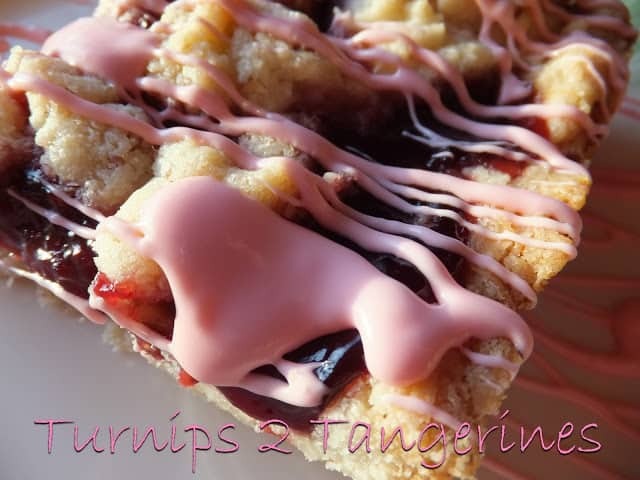 Your Raspberry Bars look amazing, I can't get enough Raspberries right now, just love them. Hope you are having a fabulous weekend and thank you so much for sharing with Full Plate Thursday. These look great! Thanks for sharing. I'm looking forward to reading more posts about your tasty treats. New follower from the blog hop. Hope you can stop by my blog and follow me back. Oh my! These look wonderful! Yum! I do not have a recipe for bars like these…nor have I ever made them. Love that they seem simple to make too! Pinning!! YUM! These look delicious, Lynn!! I will like to have one with a cup of tea please:-) Thankyou for sharing!